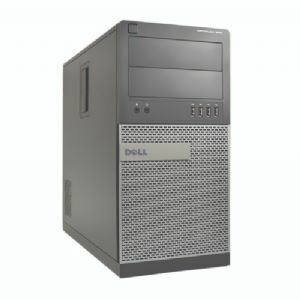 Buy the DELL Optiplex 990 Mini Tower PC 1yr Warranty at a super low price. TigerDirect.com is your one source for the best computer and electronics deals anywhere, anytime. Go through your to-do list and cross out everything written on it with the help of the DELL Optiplex 990 Mini Tower PC. The OptiPlex 990 Mini Tower Desktop from DELL is an efficient PC which can perform effectively especially during the times you need it the most. Powered by the Intel Core i7-2600 Quad-Core processor with an outstanding speed of 3.4GHz, it gets you working all throughout the day without the best performance and functionality. It supplies the right amount of power to your system to be able to respond to the most exhausting demands without breaking down. Besides, it also comes with 8GB of memory which helps you with the execution of multitasking without suffering from lags and interruptions. Furthermore, the DELL OptiPlex 990 comes equipped with 500GB of HDD storage which creates a safe a secure storehouse for your valuable data and files. It accommodates your documents, presentations, photos, videos, and large-bit applications. Other than this, it also comes with Gigabit Ethernet which offers a seamless, high-speed and reliable network along with a DVD-Writer to let you access optical discs. It also runs on Windows 10 Professional 64-bit operating system which offers a user-friendly interface for an easy and convenient manageability and accessibility. Purchase the DELL Optiplex 990 Mini Tower PC today only here at TigerDirect!